Watford striker Troy Deeney has played his first match for the club since his release from prison. The 24-year-old lasted 45 minutes in a friendly game against Premier League side Queens Park Rangers on Wednesday. 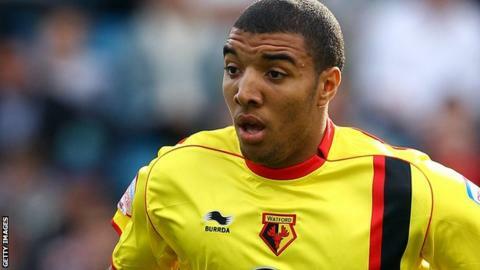 Deeney was given a 10-month prison sentence following his conviction for affray in June but was released from jail last week. The Hornets have already confirmed they will retain the player after talks with Deeney and his representatives. Deeney, who was released by Aston Villa as a youngster, joined Watford from Walsall in August 2010. The Vicarage Road club handed the front-man a 12-month contract extension in March and he finished last season with 12 goals.